With this being frostbite second year at FIFA, the sky was the limit as to what the engine could offer. You can tell first off that the graphics are going to be a strong selling point of the game. But it wasn’t on the on-pitch graphics that were the problem (besides FIFA 15 where every player looked like a bodybuilder) but the people in the crowd were. This EA heard the cry of many of its players that fans never really interacted with the players. But this year by playing the beta you can tell there is a huge change in how fans interact with the players. Score last-second winner against your rival gets ready for your fans to go crazy and rush to the pitch. Getting killed at home by 3 goals, fans will leave like a bad habit and have you playing by yourself. So now, playing a match gives you the feeling of that you are in the stadium. This might seem like a small feature but let me explain. Have ever been in the middle of a game online and had to make a sub for your left back because he is gassed. So go to make the sub and then BOOM you are met with the longest lag ever and 9/10 the game just dropped. Well, my friends you no longer have to worry about as auto subs are your friends. With auto subs, you pick at the start menu who you want to be a sub off and on the field. While you are in a game, any dead ball situation you are able to sub on a player with having to go to the menu. This feature helps out a lot in speeding up gameplay and allow for a smooth run of the game online. For a game mode, this probably has never played just due to I am that fan that refused to pick a player from a rival club and hates fantasy football, playing FUT (Fifa Ultimate Team) actually caught my attention. So something that was lacking for FUT was the ability to play with Legends (or in the game are called Icons) on the Playstation 4 due to Xbox having the rights. Well….this that all changed. EA Sports announced that Icons of the game such Maradona and Pele well be able to play. Another interesting point about FUT is how that they improved interesting mini-games such as squad builders and race to division 1. Also now you have the ability to play the mode offline by yourself or if you have a Nintendo Switch, you can play the full game on the go. It might not seem like much but improvement such as these little add up to fans that what the ability to play the game in its full version and having access to all of the features from the go. How can I talk about FIFA 18, and not mention the “star’ of the video game. The Journey 2 as it is called follows up on the career of Alex Hunter as you manage to deal with the success of being a teenage superstar in the world of football. This game picks up where you left off at in FIFA 17 or you start from fresh. From playing the game on the demo, you get a sense of much Hunter’s world has changed in 18 months. There seems to be a big push by EA to make every choice seem as though it has a consequence as last year it seemed as if most of the choice gave you the same result. Another improvement into the Journey this year is how you can customize Hunter to giving him tattoos, to change his clothes on and off the pitch, or choosing whether or not he is a creative striker or finish Center Attacker Mid. (EA please for put this into my player mode) The story is very deep this year and does not seem to drag on as seem to do last year. Passing, defense, and team play have improved. Last year if you like to play on the wings and cross a ball in you better of say a small prayer before during so because the ball was going to go everywhere except where you want it to go. What if you were trying to do a through ball, well CPU would body slam your striker out of the way to get to the ball. In FIFA 18 the improvements into this game feature make me a very happy person. Playing on the demo and beta I could tell within the first couple of minutes that passing has been improved and crosses actually go where you want them to go. But being on the opposite side of the ball has improved as well. There were a lot of moments in FIFA 17 whereas if the defense was for lack of a better of term “all of the field”. It now seems as if the issues have been fixed. When playing on defense, players seem to have a better understanding of their roles. For example, if a left back keeps making a run and overlapping the CPU will pick up on that a hit you on the counter. The another notable tweak that Ea has done is improving the way how team play. So no longer will a team in the fourth division of English Football will no longer play like Barcelona but will sit back and play on the counter. 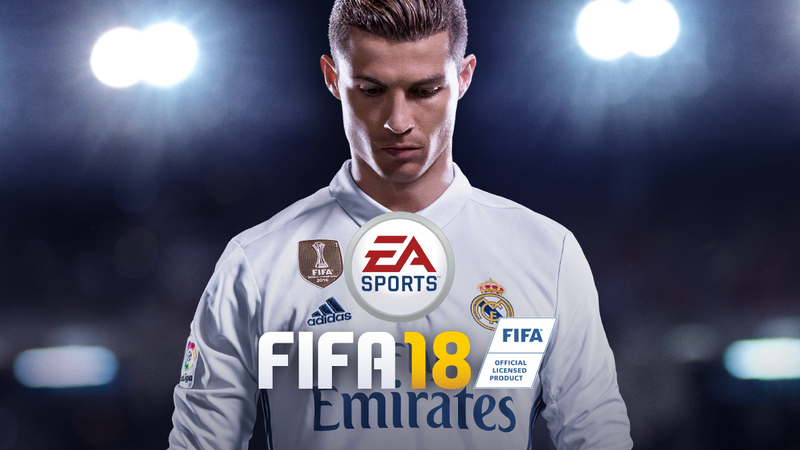 So with all that being said FIFA 18 looks like the game that we all have been waiting for. With the improvement to the game and enhanced features, EA Sports looked like it has hit a goloso into the top corner…..This is Elliot Barr aka the Black Soccer Guru wishing you a great year of FIFA and may the FIFA Gods be in your favor.